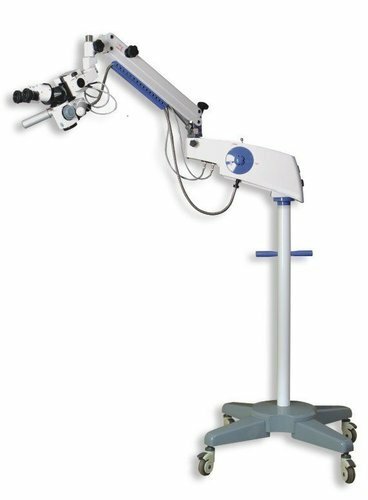 We offer ENT Surgical Microscope with light structure, with adjustable stand. Dual beam Technology offers exceptional clarity in depth, helps for glare-free surgery. Computerized assembly of lenses provides maximum depth. The ergonomically designed tiltable preloaded mechanism helps the surgeon to balance microscope head horizontally, Vertically, laterally without the help of any knob clamping. Single knob operating for the emergency switch over to stand by the light source. Incepted in the year 1998, backed by more than 15 years of industry experience, we are successfully meeting the demands of stainless steel surgical equipment that includes O.T Table, O. T Light, Anesthesia M/C, Surgical Instruments, electronic anesthesia ventilators, ENT equipment, Pacemaker and other medical equipment. Our stainless steel equipment is treated with antibacterial and anti-corrosive paints to provide the diverse range qualitative finish standards. We are a prominent manufacturer, exporter and trader of surgical equipment, scientific apparatus and other medical aids and have won accolades by delivering the same within a stipulated time frame. Leveraging on our state-of-the-art manufacturing unit and industrial expertise; we are persistently forging ahead in today's fiercely competitive market scenario.